View More In Dried Pears. 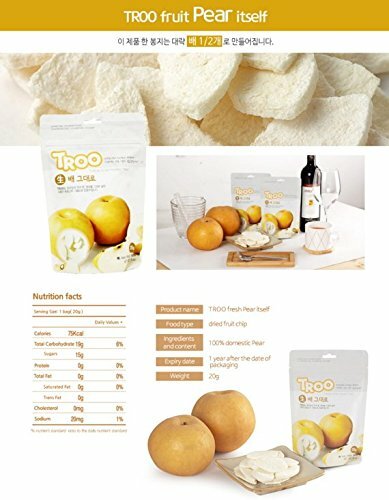 Freeze Dried Pear Chips *FDA,HACCP Approved * Gluten Free, No Preservatives, No Artificial Colors, No Additives, No Sugar * 21 gr per pack * The price is for 5 packs * As Natural it is, just removing water. * Natural Taste, Natural scent & Nutrition * Breakfast substitution * Nutrition snack for baby and children * Diet food for the people under diet * Health snack food for all of the ages. * Shipment from Korea within 2 working days. If you have any questions about this product by Troo, contact us by completing and submitting the form below. If you are looking for a specif part number, please include it with your message.